Patti Freemyer Martin’s combination of degrees led her from working as a practitioner in the field of audiology to leading systems change at Arkansas Children’s Hospital. 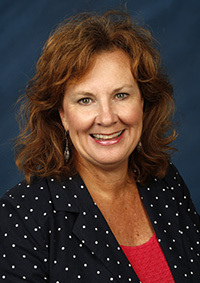 She started with a bachelor’s degree in communication disorders from the University of Arkansas and is this year’s recipient of the College of Education and Health Professions Outstanding Alumni Award in Health and Human Services. A master’s degree was required to practice audiology and Martin earned hers from a combined program of the University of Arkansas for Medical Sciences and University of Arkansas at Little Rock. She worked briefly as an audiologist in an ENT practice before she began building the Audiology and Speech Pathology department at Arkansas Children’s Hospital in Little Rock in 1985. It quickly became apparent to her that early identification of hearing loss was crucial for children and that lack of resources and access to services worked against early identification. She decided she needed a doctorate in public policy to try to make a difference, earning it from the U of A in 2006. She realized that social determinants such as poverty level, food and housing insecurity, access to services and parental education level were highly influential on a child’s communication gains. She has helped push a shift at Arkansas Children’s Hospital over the past couple of decades that focuses on the child’s family as the center of the treatment effort. Another push has been promoting early reading skills not only for children with hearing loss, but for all children. Martin is a Director in Ambulatory Care Services at Arkansas Children’s Hospital, overseeing Audiology, Speech Pathology, Primary Care services, Otolaryngology and Dermatology. She is an adjunct assistant professor of Audiology at UAMS and a consultant for the National Center on Hearing Assessment and Management. Her passion about the many ways that families affect outcomes of children is reflected by ongoing grant-funded projects, frequent invited national presentations and multiple peer-reviewed publications.